Brazed plate heat exchangers, (BHE), is used for heating of water with steam. Brazing the stainless steel plates together eliminates the need for gaskets and thick frame plates. The brazing material seals and holds the plates together at the contact points ensuring optimal heat transfer efficiency and pressure resistance. The plate design guarantees the longest possible life time. High heat efficiency makes it extremely compact and easy to install where space is limited. The unit has no gaskets and is therefore suitable in applications where temperature and/or pressure is high. 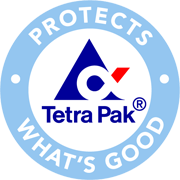 (Contact your local Tetra Pak representative to get more information about these products).